According to Merriam-Webster, mindfulness is defined as "the practice of maintaining...complete awareness of one's thoughts, emotions, or experiences on a moment to moment basis." 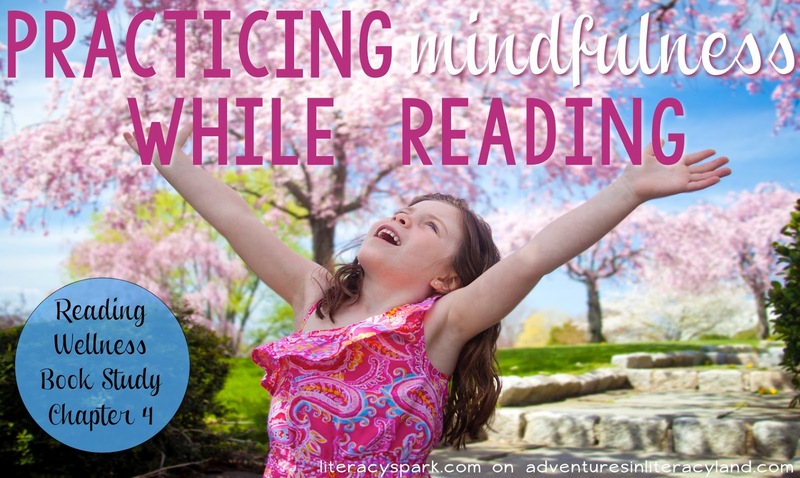 Do you practice mindfulness while reading? Sometimes I do and sometimes I don't. And to be completely truthful, when I read for pleasure, I do not. I like books that are fast paced, quick reads with lots of conversation. I'll skip entirely or skim through long detailed paragraphs just to get to the action. I've been like this since I was a child. I could whip through a Baby-Sitter's Club book in a couple of hours. Sure, I knew what happened (which was all I cared about) but I certainly wasn't practicing mindfulness or thinking deeply about the text. Now as an adult, I realize there are times that I have to force myself to focus more, to read the text slowly, and truly think about what I am reading (like when I read a professional book). I literally have to read out loud sometimes to make myself read every word. What about your students? Are they like me? Do they just want to know what happened and get to the end of the book? Or are they truly engaged and aware of their thoughts while reading? Are they able to switch from one mode to the other depending on the situation? 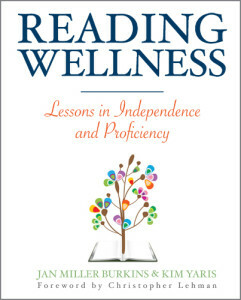 Burkins and Yaris suggest that the key to mindfulness while reading is simply slowing down and focusing on the text. How? By taking deep breaths. As you breathe, your lungs expand. 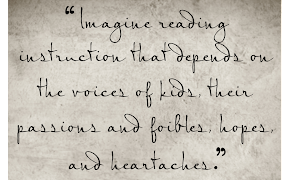 Students can feel this by placing their hands on their chests. The deeper the breath, the more the lungs are used. The same occurs while reading. Full comprehension is not achieved unless the text is read deeply. I love, love, love how this book uses concrete examples to help students understand difficult concepts! The lessons are described step by step as well making them so easy to implement. I bet you have used photographs to help your students understand the concept of making inferences. But what about close reading? Burkins and Yaris provide sample lessons in which students are asked to "read" photographs closely. Students "reread" by looking at the photographs three times. Upon a quick look, students typically just make a simple observation (There is a girl). But as students look at the photograph again and for a longer period of time, they should be able to make deeper inferences. The same occurs while reading texts. 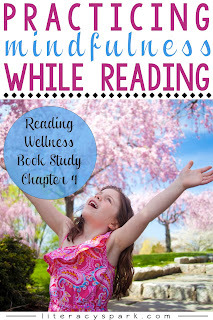 Examples of lessons for both primary and upper elementary students are included in Reading Wellness as well as picture books that can be used in the same manner with three reads. 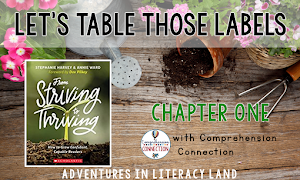 As will every chapter, the authors end with an explanation as to how the shared activities reading their reading wellness intentions. 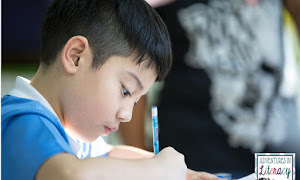 I love the idea of breathing deeply to help understand text. This really plays into making inferences, which is such a tough concept for so many students. I know when I am going too fast through something I make mistakes. 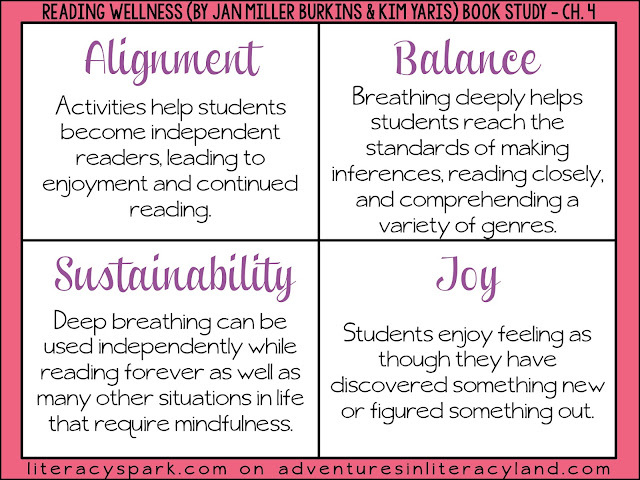 Breathing deeply in real life helps us all center our thinking, so it makes sense to use it in reading. Exactly, I love how it's such a simple thing making it easy for kids of all ages to use. The strategies in this book are so kid-friendly. Leaning in... breathing deeply... both are so easy for kids to understand and applicable in all aspects of life, not just literacy. Loving this book! So true! Reminds me a lot of the comprehension connections book since it has such concrete examples for higher level concepts.